Bio-tiful Dairy, a company specializing in organic kefir milk drinks and snack, has announced the launch of a new product made from a blend of kefir and quark. Bio-tiful Dairy Kefir Quark is advertised as a unique combination of bio-live kefir and high-protein quark that is also a source of calcium, vitamins B2 and B12 and other minerals. The new launch is described as containing over 18g of protein and as being “naturally packed with gut-friendly bacteria”, as well as free from gluten, added sugar, artificial colours, flavours and preservatives. The product comes in pots with a spoon included, in Original and Cranberry & Chia varieties – the latter featuring a topping of chia and other crunchy seeds. 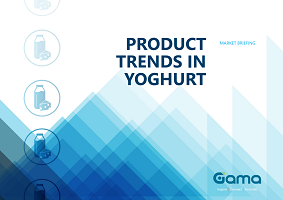 Commenting on the launch, Bio-tiful Dairy founder & CEO Natasha Bowes said: “We are delighted that for the first time ever we are bringing together two of the very best and healthiest dairy products – Kefir and Quark. 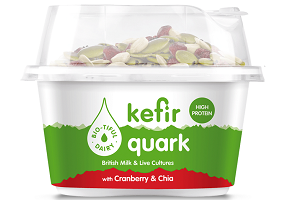 Naturally, Bio-tiful Kefir-Quark is of the highest quality and boasts an exceptional list of natural health benefits, which we are so excited to share with UK consumers”.